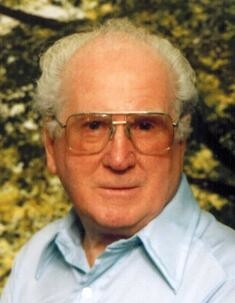 Robert Donald Shumway, 97, of Tiffin, passed away on Thursday, March 21, 2019 at St. Francis Home. He was born on November 24, 1921, in Tiffin, Ohio to Wesley B. and Maud E. (Herrick) Shumway. On November 1, 1941, he married Jimmie Arthur and they were married for fifty years. Survivors include his sons, Albert (Nancy) Shumway of Harrison, Philip (Gladys) Shumway of Tiffin, Chuck (Carolyn) Shumway of Mansfield and George (Dixie) Shumway of Harrison; daughters, Merilyn Shumway of Tiffin and Carol (Andrew) Feasel of Republic; seven grandchildren, Julie Pruitt, Jason Shumway, Lisa Shumway, James Shumway, Loretta Keller, Chad Feasel and Kyle Feasel; 23 great-grandchildren; 5 great, great-grandchildren. He was preceded in death by his parents; wife, Jimmie; brothers, Ruel Shumway, Wesley Shumway, David “Herrick” Shumway, Maurice Shumway and Stanley Shumway; sisters, Mercedes Haugh, Mary Creeger and Geraldine Stuckey. Robert attended Tiffin Columbian High School and served in the United States Army, during World War II, from 1943 to 1946. He was a machinist at RCA, Singer Mfg. and retired from Bellevue Mfg. He was a 70-year member of the Tiffin Masonic Lodge #56 and member of Baku Grotto, Mansfield, Ohio, VFW Post 2858, American Legion Post #169, lived in Florida and Alaska, enjoyed woodworking, hunting, star gazing and traveling and camping in Florida. Friends may visit with the family from 11:00 A.M. until 12:00 Noon on Monday, March 25, 2019 at Hoffmann-Gottfried-Mack Funeral Home & Crematory, 236 S. Washington St., Tiffin, Ohio 44883, (419) 447-2424. Burial will follow in Seneca Memory Gardens with military honors being conducted by the United Veterans Council.